Last month I was in the Kensington area of London with about 40 minutes to spare between appointments. What better place to visit than the Victoria and Albert Museum. 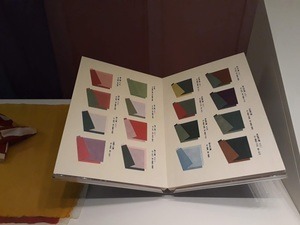 There just happened to be an exhibition of natural dyeing in the Japanese Gallery with displays relating to one man’s search for lost techniques. 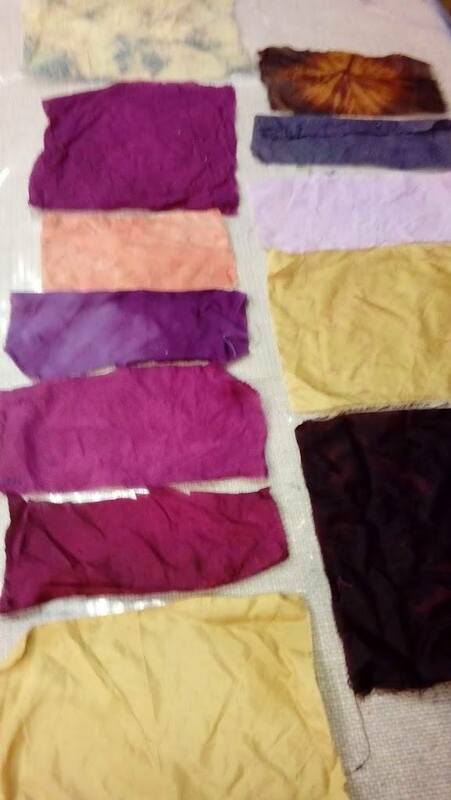 Videos not only showed some of the dyeing processes but also explained about some of the ceremonies that related to the practice – including the making of dyed paper flowers (see below). Sadly the display has gone now and my images do not do it justice, but it just shows how even a half hour visit can be quite inspiring. 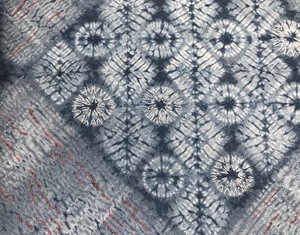 Spending a few days adding a little minimal stitching to (hopefully) enhance my large Shibori piece. Proving a pain in more than one way as I’m suffering with a really painful thumb joint which makes pulling the needle through excruciating so it’s been going very slowly. Hoping I’ve finished but looking at the pic just wondering if I need more. My new motto is the work is not finished until the packaging and means of transportation are sorted! 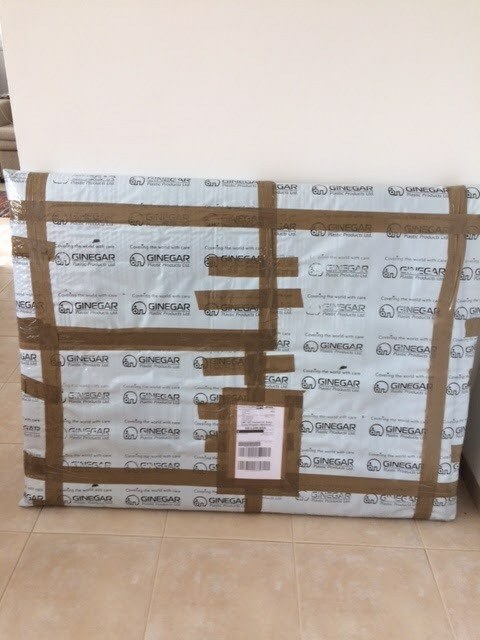 And so, the normal excitement of collecting my work from the framer was slightly overshadowed by the reality that it was now that delivery to the UK had to be dealt with. After several days and many phone calls and running around (not aided by a nasty flu virus), we are ready for collection. DHL is supposedly appearing at my little house in the North of Israel on Sunday and as if by magic my work should be in Chelmsford ready for me to bring to the next EAST meeting. I have done my best. It will probably take as many days to unwrap all the layers, but only then will I truly give a sigh of relief and think finished! Fingers crossed please! 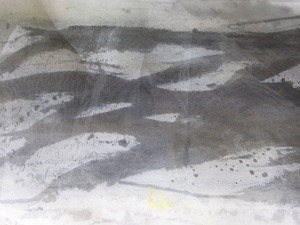 Mark making on silk organza using procion dyes and Manutex with bits of garden hose, an old umbrella handle, edge of a credit card, etc. 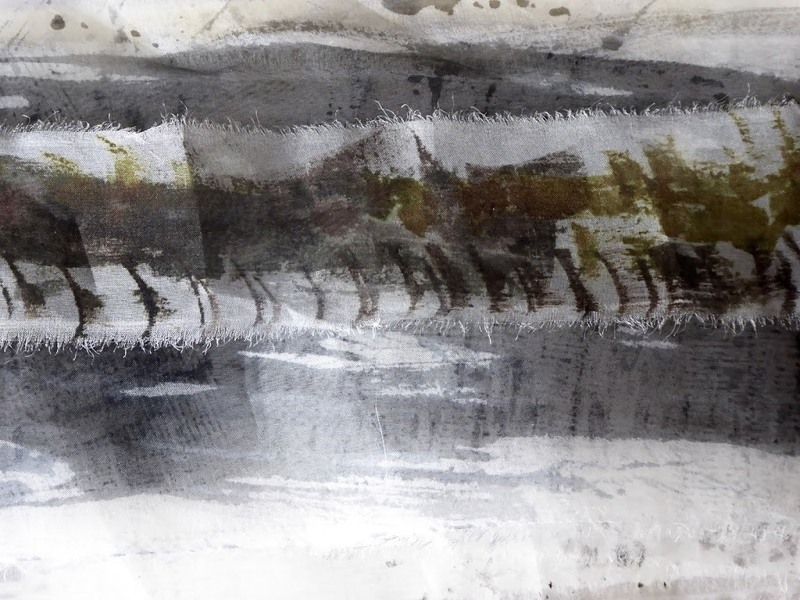 Overlaying and arranging till a winter landscape emerges – a few spare hours playing with fabric. 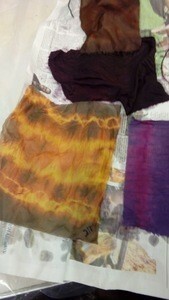 Students on my workshop [Jenny Leslie] worked very hard yesterday. We used 3 natural dyes, brasil wood, buckthorn bark and woad. 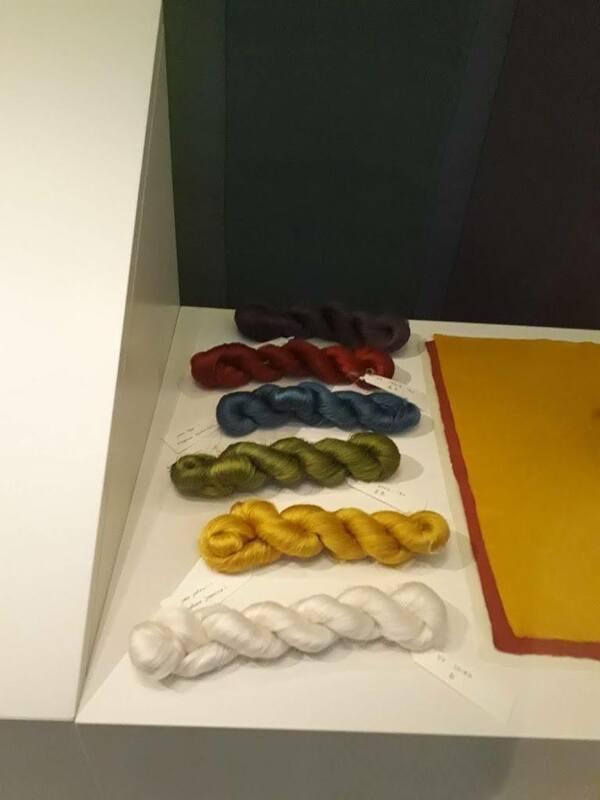 After dyes some fabric we over dyed with woad and applied after baths to get a very good range of colours. These are the students results aren’t they great. Oceania, is one of the current exhibitions at the Royal Academy in London (continues until 10 December 2018). 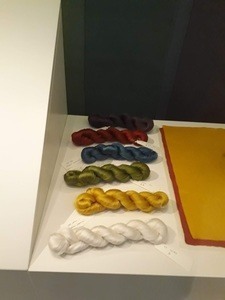 This is a personal reflection of some of the issues and objects I found particularly interesting but especially those linked to textile art. On entering the gallery you are confronted by an enormous blue cloth – stitched and slashed – made by the artist Kiko Moana of New Zealand. 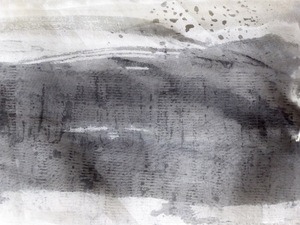 It seemed to me the perfect illustration for an exhibition that was considering the art and cultures of a region both connected and divided by water. 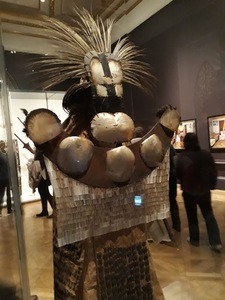 As a modern work it was also a reminder that this is not about an art and culture from the past – this was an exploration of Oceania throughout its history. The second art work was a film, Tell Them, by Kathy Jetnil-Kijna. 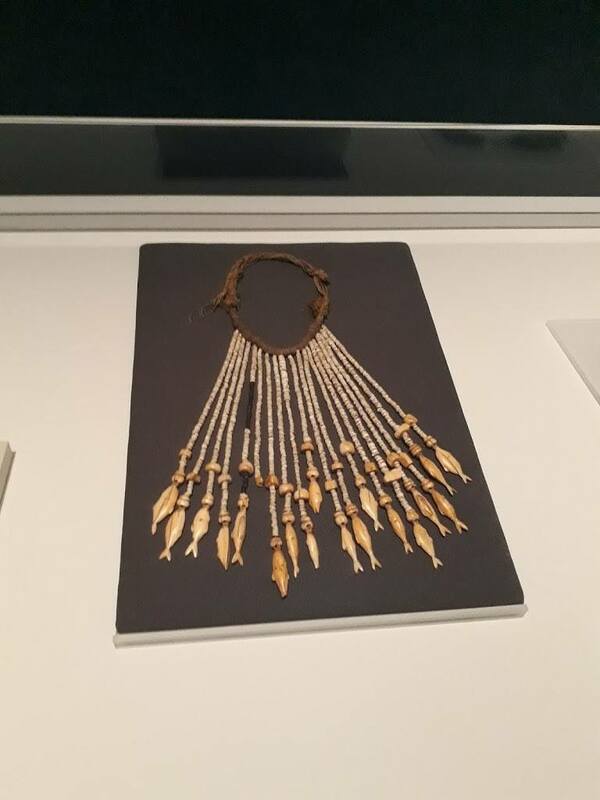 It begins with a description of a piece of jewellery, leads to a discussion about Marshall Island and its people, and ends with their fears for the future. 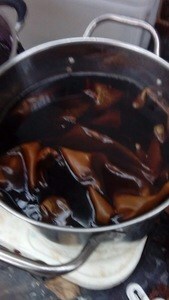 It was about the links between cultures. It was a reminder that actions in one part of the world impacts on others. 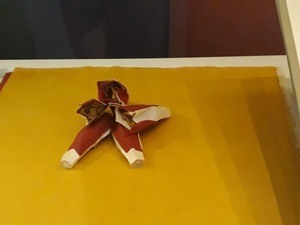 The exhibition continues with a vast array of items – canoes, figures, musical instruments, navigational charts each one telling just a little about a vast array of diverse communities. 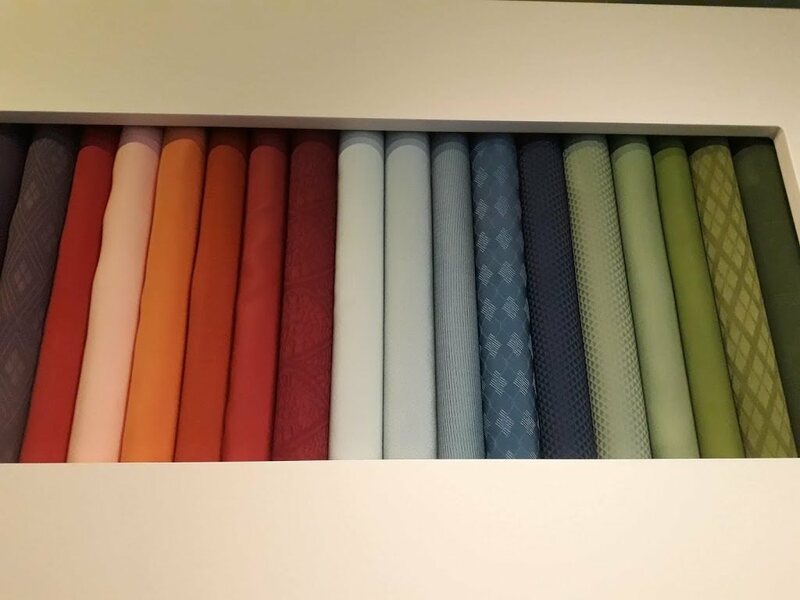 There were also plenty of textile items. 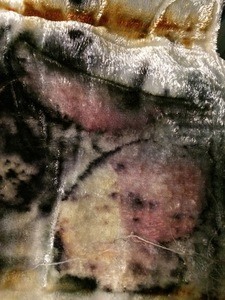 There were many pieces of bark cloth but also pieces of patchwork. 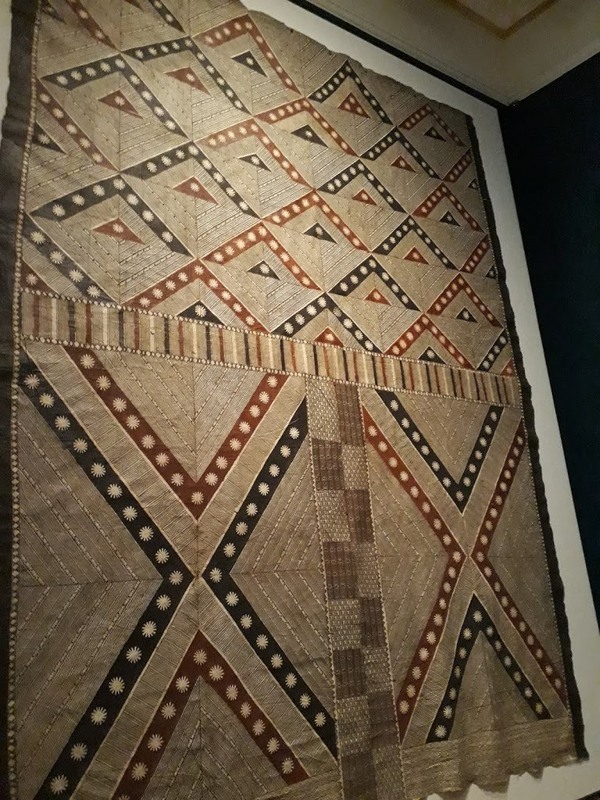 The relevance of Samoan fine mat was fascinating in that these precious items were also used in ceremonies of reconciliation. 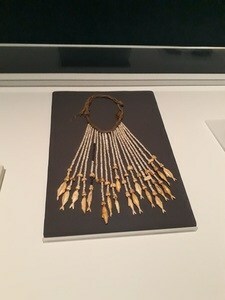 In addition there were several pieces of jewellery. 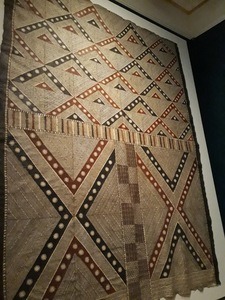 The curators of this exhibition were not shy about discussing the problems that began when Europeans, James Cook in particular, first encountered many of these cultures. Equally the curators were keen to highlight that not all of the objects displayed were looted items – many were gifted by their original owners or traded. Curation and display, it seems, was also a big part of this story. 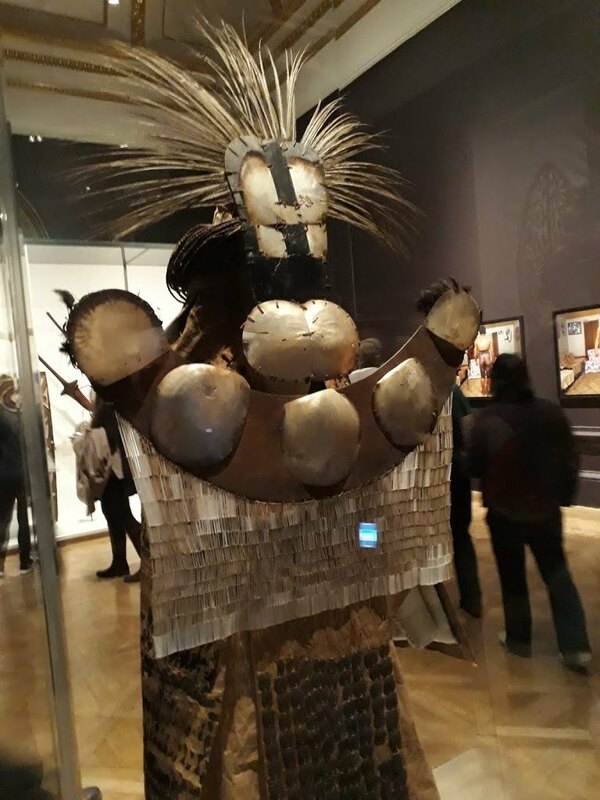 The impressive mourner’s costume was a reminder that many of the objects on display were not originally intended to be static items but were part of a larger picture that would have included sound, scent, movement, etc. It highlights another major theme – that many of the objects are about memory. 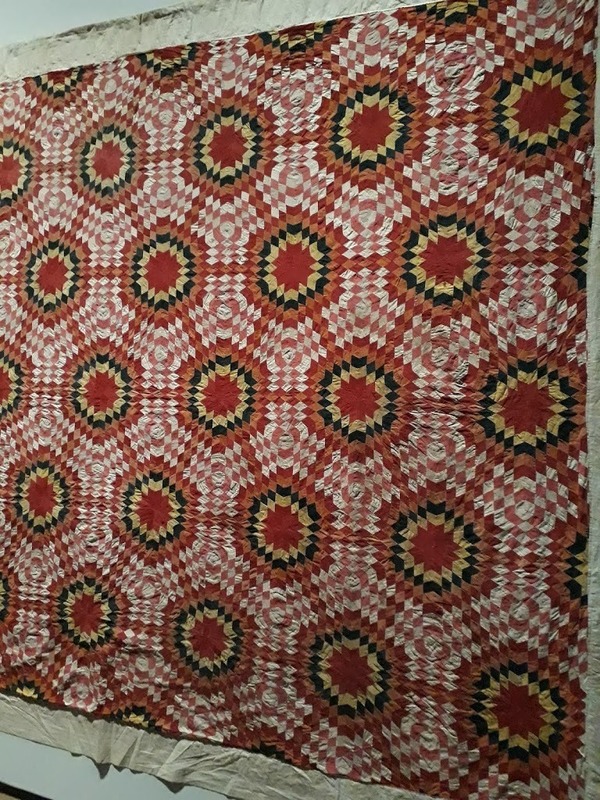 The past and the present are combined in such items. 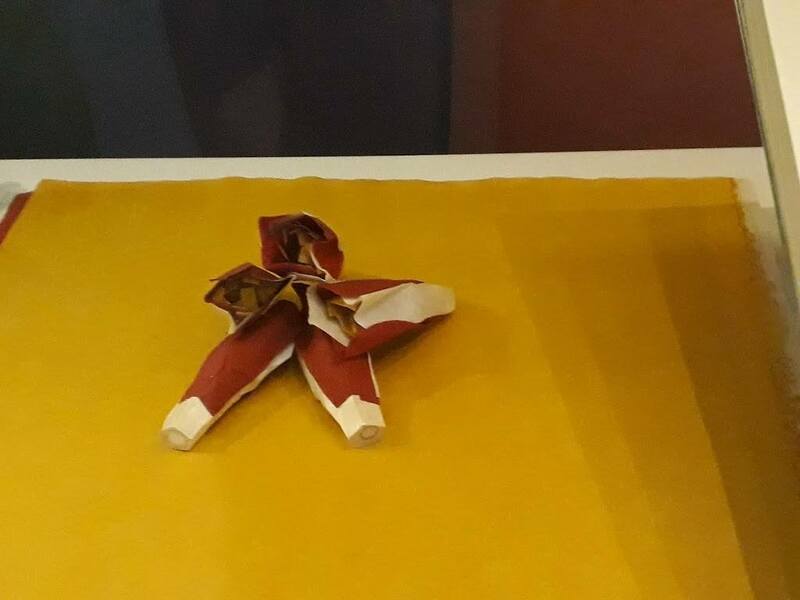 Having visited the British Library‘s exhibition James Cook: The Voyages (which finished at the end of August), it was interesting to see two such different responses to the same starting point – both exhibitions relate to the 250 year anniversary of James Cook’s first voyage of discovery. Both were very thought provoking and both were reminders of how the actions of the past still resonate in the present. 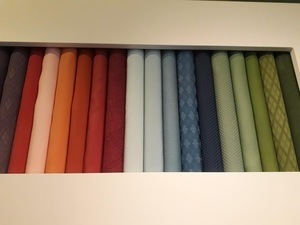 These are really worth seeing, inspiring designs and beautifully made! PROCESSIONS was a mass participation artwork to celebrate 100 years of votes for women. 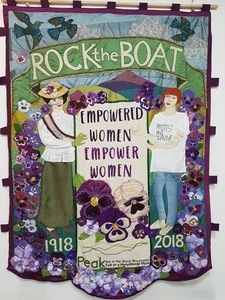 It was an open invitation to every woman and girl across the UK to get involved by being present on Sunday 10 June in one of the four UK capitals: Belfast, Cardiff, Edinburgh or London; inspired by the great processions of the suffragettes and suffragists in the years leading up to 1918, who marched to demand the vote. 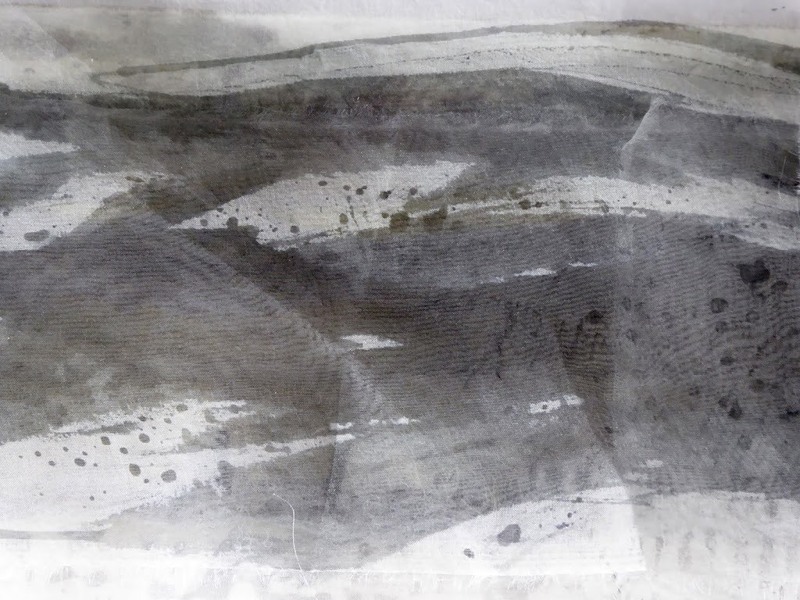 In this special exhibition for SPILL, 100 banners created around the UK for PROCESSIONS will be shown as a trail at various locations across Ipswich. 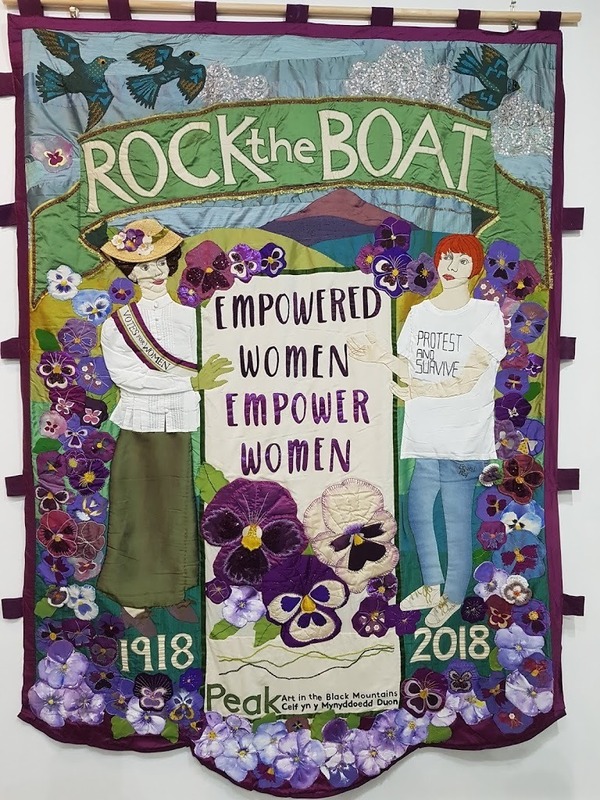 Have a look at the link below and even if you can’t get to see the exhibition there is a good video showing many of the amazing banners. 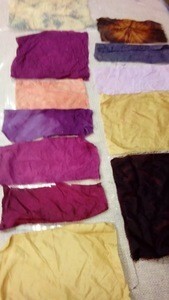 What a lovely way to spend my Saturday this autumnal weekend, learning about dyeing using leaves. This image is a detail from some silk velvet fabric that I used for one of the samples, showing some of the subtle colours that can be achieved, as well as more dramatic ones. Jenny expertly guided us through some variations of this fascinating natural dyeing method, and we produced several samples with a range of effects. I felt totally immersed (no pun intended) in this workshop, and spent much of Sunday thinking how I’ll be using what I’ve just learned in my current project. 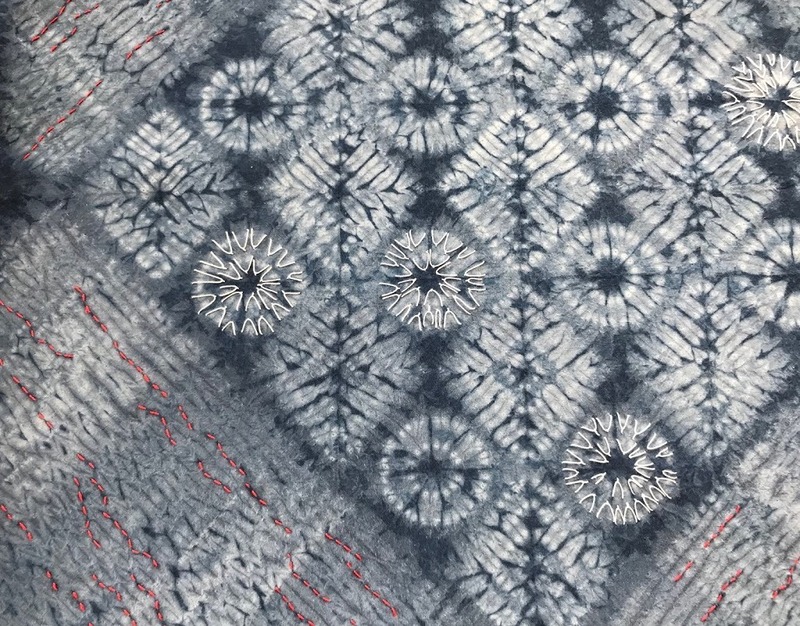 For the Power of Stitch, EAST’s 2019 exhibition theme, I’m focusing on Caister, on the Norfolk coast, and I think I may have just found the perfect North Sea muddy blue, courtesy of Jenny and some purple carrots … watch this space! The ERTF conference last Saturday was right up my street. Alice Fox talked about her work. 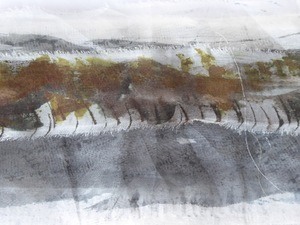 I really like the way she concentrates on her theme, often the coastline and really develops it, and of course her work is very environmentally friendly. I hope to use ideas from the talk and workshop in my future work for East. 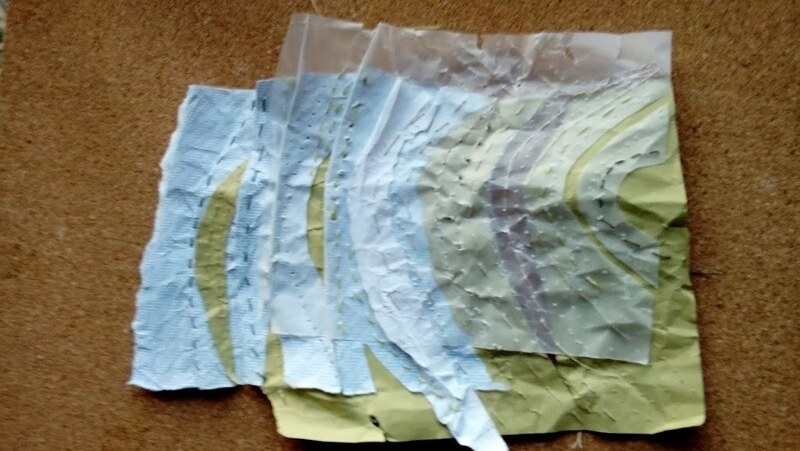 This is my work from the mini workshop, we were all given four pieces of paper and we stitched them together, it was surprising how many different small works we made. For my work for The Power of Stitch I am trying to depict the power of nature through volcanic activity, so I wanted a bright red. 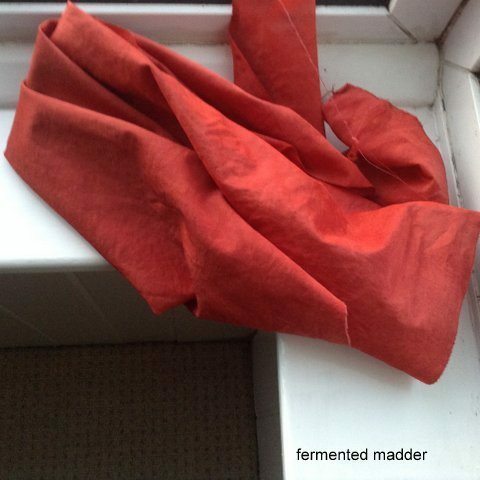 A bright red is not easy to get with natural dyeing, but fermentation dyeing works well with madder. I put 100 grams of ground madder in a 4 pint plastic bottle and filled nearly to the top with water. Every day I removed the lid to let any gases out and gave it a good shake. Madder works better in a high PH and fermentation tends to make the dye acidic so after a week I added a teaspoon of slaked lime. 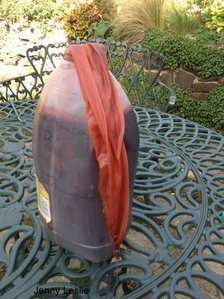 After 3 weeks I put the liquid into a dye vat and added wetted out fabric. 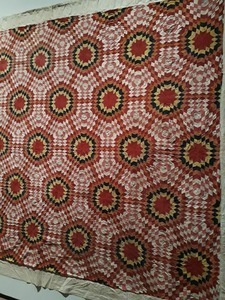 This is a silk cotton mix fabric. 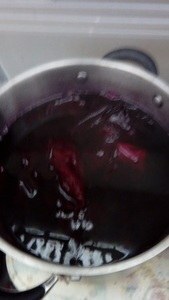 I soaked it in the dye vat for a day and this is the result, just what I wanted.